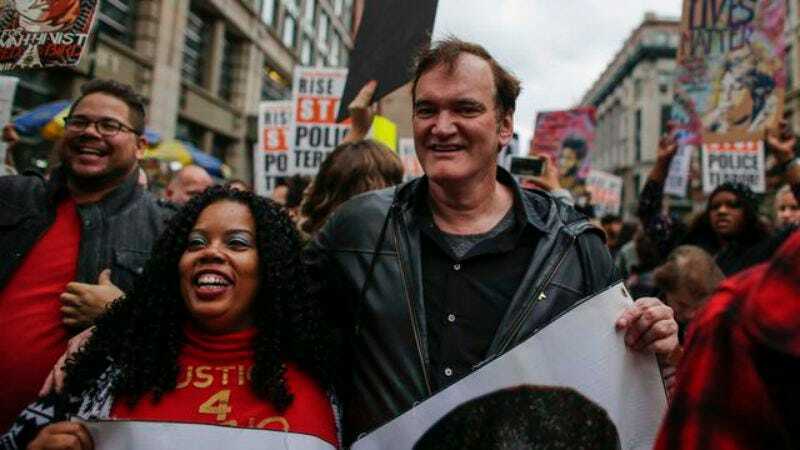 Last weekend, Quentin Tarantino participated in a rally in New York that was organized by RiseUpOctober to protest police brutality. The director did such standard, civilly-disobedient things as march with other protesters and hold up a banner. And when asked about his presence at the event, Tarantino said, among other things, “I’m here to say I’m on the side of the murdered.” The unfortunate timing of the long-planned event, which occurred just days after a police officer was killed during an arrest, was not lost on Tarantino, who noted that the officer’s death was also tragic. Tarantino’s apparently (though not to us) insouciant actions (and filmography) were interpreted by the Patrolmen’s Benevolent Association as tacit endorsement of violence against law enforcement, and the PBA called for a boycott of his films. The union’s president went so far as to call Tarantino a “cop-hater” who’s made “a living glorifying crime and violence,” because there’s no room in the thin blue line for nuance. Now MSNBC reports that the LAPD’s union has heard the NYPD’s call and is also urging people to boycott Tarantino’s movies. Craig Lally, president of the Los Angeles Police Protective League, issued a statement in which he called Tarantino irresponsible for participating in grassroots activism. Lally stated that, while his organization supports “constructive dialogue about how police interact with citizens,” that only goes so far. But there is no place for inflammatory rhetoric that makes police officers even bigger targets than we already are. Film director Quentin Tarantino took irresponsibility to a new and completely unacceptable level this past weekend by referring to police as murderers during an anti-police march in New York. Tarantino hasn’t responded to the bicoastal boycott plans, which would probably center on avoiding The Hateful Eight at all costs come December. The New York and Los Angeles police departments don’t know it yet, but they’re indirectly contributing to Alvin And The Chipmunks 4’s box-office haul, which is a questionable action in and of itself.